Protesters hoisted a sign outside state Supreme Court ahead of continued negotiations over the fate of Long Island College Hospital on June 3, 2014. CIVIC CENTER — Just weeks after Mayor Bill de Blasio announced a “truly historic” deal that “kept the wolf from the door” of the threatened Long Island College Hospital, those who once supported the mayor say he's done nothing to prevent that deal from falling apart. Although De Blasio's run for mayor surged forward when he was arrested last June during a protest to save the Brooklyn hospital, some former allies now accuse him of using the hospital as nothing more than a political prop. “He gave us this false sense of hope that, if he was chosen to run the city, then LICH would be saved,” said Charlene Nimmons, president of the Wyckoff Gardens Tenants Association, who said she's been "very disappointed" with de Blasio in the months since he praised her work with LICH at a press conference at City Hall in February. She said it was a betrayal to the community when de Blasio chose to stand by and do nothing while the State University of New York, which owns the hospital, broke off deals with the top two bidders — one of which, The Peebles Corporation, is minority-owned. It was a far cry from de Blasio's earlier promises to “insure healthcare for this community for the long term" by announcing a deal for a new round of bids for LICH in February that would include significant community input and guaranteed medical facilities. “Today, we have a plan that leaves no one behind,” de Blasio said at the February press conference. "We have a plan that protects the healthcare needs of our community. And this guarantees the fundamental right to community healthcare for the 80,000 people who rely, first and foremost, on LICH today." De Blasio continued to defend the status of the LICH talks as recently as last month. "I'm convinced health care will be saved," de Blasio said. "I don't have any question about that." SUNY has since failed to come to an agreement with any of the top bidders, and could soon be a position to do exactly what community activists had worked so hard to avoid: sell the property to developers for top dollar, without the promise of a full-service hospital. On Tuesday, community activists once again headed to State Supreme Court in Brooklyn, as SUNY and Fortis Property Group, the third-highest bidder under the deal touted by de Blasio, continue to negotiate a possible agreement. Fortis currently has no plans for a full-service hospital at the LICH site. 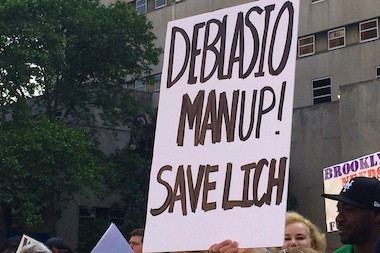 Dr. Saul Melman, an emergency room doctor at LICH who was laid off on May 22 when most of the hospital closed, was among those assembled outside the court Tuesday, holding up a sign demanding that de Blasio “man up” on LICH. Melman said de Blasio’s statements of salvation for LICH in February were “untrue” and “premature,” and said the mayor hasn’t been involved in the fight since. Political experts said de Blasio's failure to deliver on the LICH issue has far more implications than just disappointing some of his key allies. It could spell trouble for de Blasio's other initiatives, from universal pre-kindergarten to the creation or preservation of 200,000 units of affordable housing, experts said. Too many early failures to deliver on promises could endanger the mayor's reputation with an increasingly skeptical public and reduce his political capital.